Donovan is the heart of this DLC, not only in the story but in the action as well. He’ll be fighting right alongside you. Together, you will uncover a dangerous plot in New Bordeaux that leads you on a chase throughout the city, and ultimately to a new island location that holds secrets long held classified. What’s New in “Stones Unturned”? A thrilling new story, hunting down a rival from the past. Join Donovan on a chase to catch former rival Connor Aldridge and his mercenary army, who are on the trail of a downed aircraft carrying hazardous cargo. Dive into the action with fan-favorite John Donovan. Donovan is leaving the motel room and joining Lincoln in the action! He’ll be right alongside you every step of the way, cracking wise as your wingman. That also means we’ll get more great memorable moments with these characters, drawing upon their brotherhood forged during their time in Vietnam. New environments to explore. We’re leaving New Bordeaux and heading to a brand new dense jungle island – something not yet seen in Mafia III. In addition to tracking a downed military plane and its cargo across this new island, we’re also exploring some unseen areas in New Bordeaux while on Aldridge’s trail. Bounty Hunting missions. After completing the story of “Stones Unturned,” team up with new associate Robert Marshall to track and subdue key targets causing unexpected trouble around New Bordeaux. New tools to play with. Lincoln and Donovan are going against a well-armed mercenary force, so they’re going to need a few extra weapons to play with. Weapons: Hop in the back of a vehicle-mounted turret and take out incoming foes, or go loud with the improved grenade launcher and RPG. Sniper Service: You’ll also get the ability to call in Marshall’s Sniper Service to quickly pinpoint and take out enemies. Outfits: Go tactical with the new Jungle Camo commando garb for more serious affairs, or don the Party Animal outfit for a casual look that would fit just right on an island or in a Cuban café. New Fleet Vehicles: The heavy-duty Griffin Borneo Sport joins Lincoln’s fleet after completing the story missions. Make sure to complete all of the bounty hunting missions to get the sporty De’Leo Stiletto, as well as new decals for customizing your ride. If you’ve purchased the Deluxe Edition of Mafia III and have redeemed the Season Pass code in the box, or purchased the Season Pass individually, you’ll receive an automatic update adding “Stones Unturned” to your game. 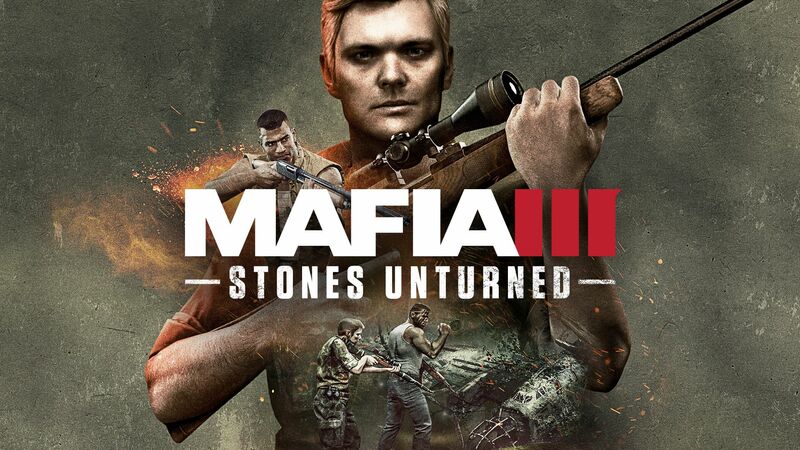 You can also purchase “Stones Unturned” and any of the Mafia III DLCs individually on the digital storefront of your choice. To access the DLC, you’ll need to have brought all three Lieutenants to your side before you’ll be able to kick off the DLC by meeting with Donovan. “Stones Unturned” is the second paid DLC for Mafia III, following our first DLC “Faster, Baby!” Next up is “Sign of the Times,” which explores a mysterious and violent cult making waves in New Bordeaux. Follow us on Facebook, Twitter, and YouTube to get all the latest Mafia news as it hits. From all of us in New Bordeaux, thanks for playing Mafia III!